The artist begins with a black canvas. In an effort to locate her body in relationship to the canvas, she assigns herself a task—to make an arch with arm outstretched. Slowly she applies the paint. Dashes of white trace the length of her arm. 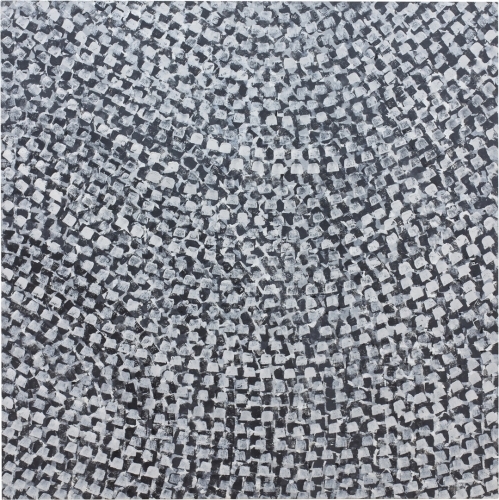 Hour by hour, she turns, circles and shifts the canvas until the surface is covered in tessellated scales of gray. “Untitled,” 2013, is a series of five blue squares. Each sheet of paper is marked with the hatching and cross-hatching of a Bic ballpoint until the pen runs dry. Layer upon layer of monotonous markings are transformed into delicate gradations of blue. The artist grew up in the years after the Iranian Revolution in 1979. As a child she observed the teeming metropolis of Tehran where exhaust fumes mingled with the smell of jasmine. She imagined stories of buildings and the crows that sat gently perched on the telephone wires. The stories became drawings, and the drawings became animation, brought to life by a makeshift zoetrope fashioned from cardboard and carefully incised with vertical slits. On a warm Sunday afternoon, I visited the artist in her small Hyde Park apartment. We went on a long meandering walk. “Living by the edge of the city, I see the line of the horizon,” she said. “It gives me a sense of grounding, locating, placing. It is a way of knowing.” In a series of digital photographs titled “Encounter,” made this year, she pixelates the line of the horizon line by placing a sheet of paper meticulously punctured with holes in front of the camera lens. No longer able to distinguish between earth and sky, foreground and background, the viewer is left in a state of disorientation. Nazafarin Lotfi shows at Andrew Rafacz Gallery, 835 West Washington.